A look at what’s new from Ribbon Communications, Over.ai, Mist, VMware, Workplace by Facebook, Cradlepoint, 128 Technology, and Voxai Solutions. In this week's No Jitter Roll, we look at announcements around artificial intelligence (AI), communications platform as a service (CPaaS), collaboration, software-defined WAN (SD-WAN), contact center, and network connectivity. Ribbon Communications this week announced it will be incorporating Over.ai's natural language voice AI platform into its UCaaS and CPaaS offerings. To start, it's focusing on adding virtual assistant services to its UC clients and contact center services, the company said. "Voice AI is really about enablement and simplifying processes," said Over.ai CEO Noam Fine, in a prepared statement. The "benefits translate to multiple use cases, whether by adopting virtual agents to extend a customer's access to your sales or support team or improving staff productivity via task automation." Wireless platform provider Mist this week announced interoperability between its Learning WLAN and VMware NSX SD-WAN by VeloCloud in what the company said is an effort to bring AI-powered automation and programmability to the wireless LAN and WAN. The goals are enhanced user experiences, better network visibility, and more cost-effective troubleshooting, especially as the number of mobile devices, users, and applications grows and workforces become more distributed, Mist said. 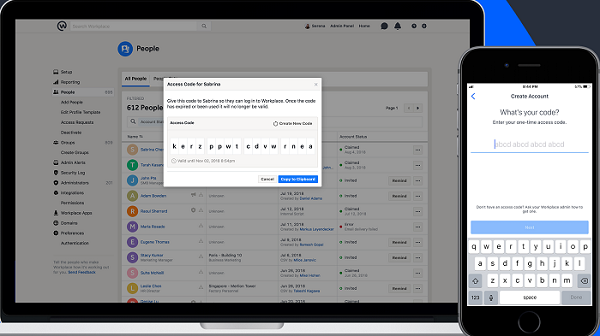 Workplace by Facebook this week announced an admin feature that allows employees to get started with the premium version of the team collaboration solution without providing a company email. In doing so, it is enabling deskless workers who may not have company emails to get full access to the tool. Instead, as shown below, they can use their employee IDs for access. This feature follows on the numerous updates and product launches the company has made since June, as outlined in this Workplace by Facebook blog post. For example, Facebook has given administrators the ability to segment the community and manage groups depending on parameters like job title or location. And for users, Facebook has launched a test feature that will automatically create chat groups for existing Teams & Projects groups, aimed at solving the problem of Workplace groups needing to recreate their groups on chat. Cradlepoint, 4G and 5G wireless network edge solutions provider, has announced that it has received FirstNet Ready status and approval for its MC400 Modern Module for use with the wireless broadband network for first responders that AT&T is building (see related No Jitter post). The MC400 Modern Module is a field-upgradeable version of its plug-in LTE modem for compatible IBR and AER series router solutions, Cradlepoint said. It is aimed at addressing a broad set of first responder connectivity challenges like distributed sites, vehicles, mobile command centers, and numerous in-vehicle and in-the-field IoT devices that include sensors, cameras, drones, and robots. All MC400-equipped IBR and AER series LTE routers support FirstNet's critical functionality as well as public safety's Band 14 spectrum, Cradlepoint said. The certification process involved hundreds of testing hours covering a range of functionalities, including security, durability, and network impacts. Voxai Solutions has selected 128 Technology to provide enhanced network connectivity to its hosted contact center solution vInteract, which is built on Genesys's PureEngage platform for private and hybrid cloud configurations, as announced this week. Voxai is leveraging the 128T Networking Platform to deliver real-time failover of call center services, compliance with industry regulations like PCI DSS, the ability to layer in vInteract cloud connectivity into existing network and security topologies, and cost savings, 128 Technology said. "Enterprises relying on legacy, hardware-based network technology are in for a rude awakening when they try to integrate their networks with cloud services," said 128 Technology CEO Andy Ory, in a prepared statement. "These legacy integrations can be expensive and complicated, and performance for both the customer and provider can be limited" – which is what Voxai is trying to head off with this partnership.